Support Universal Healthcare in New York! 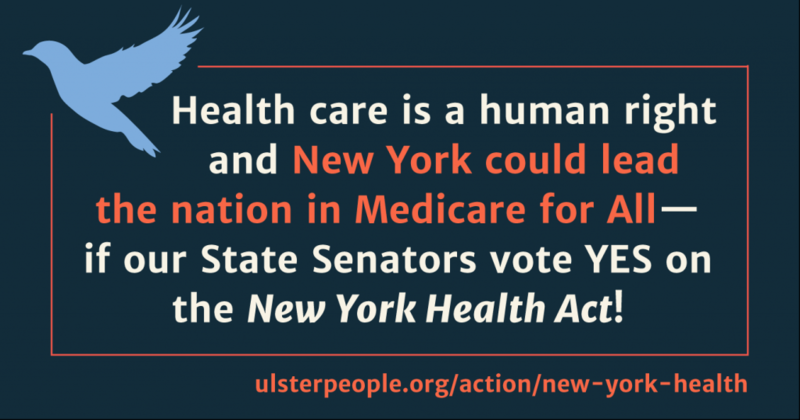 Health care is a human right and New York could lead the nation in Medicare for All — if our State Senators vote YES on the New York Health Act! What is the New York Health Act? The NY Health Act is a bill for comprehensive, universal health coverage for every New Yorker, provided through a single-payer system that would replace private insurance. You pick your health care providers. No network restrictions. All New Yorkers are covered and patients and doctors make health care decisions— not insurance companies. Coverage is funded through a progressive payroll deduction similar to FICA, based on ability to pay. No premiums, deductibles or co-pays. Simplifies and reduces costs for employers by taking them out of the business of buying health coverage. No more wasting billions of dollars each year on insurance administration and profits for big corporations. Can universal health care really happen in NYS? Yes, and we are closer than ever. Last year, the bill easily passed the NYS Assembly. However, the bill got stuck in the NYS Senate Health Committee. Two of the State Senators who represent our region (Seward and Larkin) are on that committee and they need to know that you want to see them not only get this bill out of committee, but that they will vote YES for the bill once it gets to the floor. Without the ACA, or a diminished ACA, will the NY Health Act still be financially viable? Yes, and it can actually help NY deal with the consequences of Trumpcare. With the damage that is being done to the ACA, NY will lose some of its federal health care funding. These losses can be offset by the savings that NY Health delivers—through decreased administrative costs and higher bargaining power for pharmaceuticals and medical devices. For in-depth information on the New York Health Act, visit the Campaign for New York Health website. This economic analysis is also particularly helpful in understanding the financial impacts of the NYHA. Please look up your State Senator here if you are unsure who to call. When calling your State Senator, you may get lucky and actually speak with him, but it will more likely be a staff member. Hello, my name is ____________ and I’m one of your constituents from the town/city of __________. Plus, if the ACA continues to lose funding, NYS will lose some of its federal funding for health care. These losses can be offset by the savings that NY Health delivers—through decreased administrative costs and higher bargaining power for pharmaceuticals and medical devices. Will you co-sponsor this bill, Senator_________? If he says yes, thank him heartily! Did you know that New York Health Act is widely supported by a diverse group of your constituents that includes educators, health care workers, utility workers, teamsters, machinists, auto workers, and transit workers, as well as many of your colleagues in the NYS Legislature? If you won’t co-sponsor at this time, will you commit to vote for this bill when it comes up for a vote in the future? If he says yes, thank him! Is there more information that I can get you so that you can support this bill? Please write down the information needed and tell your Senator, “I’ll get back to you on this.” Contact Charlotte of Ulster People and she will help with follow-up. Let’s convince our NY State Senators to co-sponsor the New York Health Act by writing letters to newspapers and getting the word out. Urge friends and neighbors to send letters to the editors of your local newspapers as well. When you submit your letter, include your name, home address, email address, and daytime phone number, as some publications may call you for verification. Feel free to submit to more than one newspaper. Please look up your State Senator here if you are unsure who to write to. I am writing to urge you to co-sponsor the New York Health Act, providing universal and affordable health care to all New Yorkers. As a ________ (parent, teacher, business owner, etc) in the community, this bill will help me by (your personal story eg , allowing me to choose our own doctor for a sick relative, making NY business friendly since it reduces costs for businesses, making it more affordable with no deductible or co-pay). In addition, the New York Health Act will reduce costs for the state of NY, even if ACA is repealed, by reducing administrative waste and increasing bargaining power for pharmaceuticals and medical devices. PLEASE CO-SPONSOR THE NEW YORK HEALTH ACT, Senate Bill S3525. Universal health care may be out of reach nationally, but it’s possible in New York—if our State Senators vote YES on the New York Health Act. The NY Health Act is a bill for comprehensive, universal health coverage for every New Yorker that would replace private insurance. The bill already has enough votes to pass in the NYS Assembly and only five more votes are needed in the NYS Senate for passage. With the NY Health Act, we’ll have freedom to choose our health care providers and our doctors—not insurance companies—will decide what is medically necessary. The coverage will be paid for like Medicare, based on one’s ability to pay so it will be fair, and it’s good for local businesses, because employers will no longer have to buy health insurance for their employees. In addition, the New York Health Act will reduce costs for the state of NY, even if ACA is repealed, by reducing administrative waste and increasing bargaining power for pharmaceuticals and medical devices. PLEASE CALL YOUR STATE SENATOR AND URGE THEM TO CO-SPONSOR THE NEW YORK HEALTH ACT, Senate Bill S3525. We’ll all be healthier for it! Now is our chance to help New York vote! Demand a Public Hearing on the Transgender Anti-Discrimination Law!